I am really excited about this year's Latinos in Tech Innovation & Social Media (LATISM) conference. This year is going to be extra special. 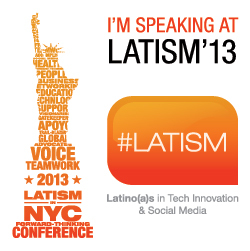 This year is LATISM's 5th year and they are returning to New York City! Which means it's only a subway ride way for. And it's at the Waldorf Astoria. It's September 19 - 21. My birthday is on the 18th so I get to celebrate my first days of my 38th year with some of my favorite bloggers. I'm SPEAKING! I am truly honored for the opportunity to speak at LATISM. I am truly grateful for all the opportunities LATISM has given me. I was recognized as a Top Bloguera and invited to a White House press conference. I was awarded the Best Latina Health Blogger at the LATISM12 Conference. Last year I was excited to present on the Blogging 101 session. But this year, I'll be on a panel discussing a passion much closer to my heart. I'll be with four amazing Latinas: Eileen Carter-Campos, Christina McGeough, Eliana Tardio and Laurita Tellado. To learn about them and more on the panel topic click HERE. I cannot thank LATISM enough for giving me the opportunity to share my journey, to tell my son's story and to inspire others to share theirs. It is important that we do this. 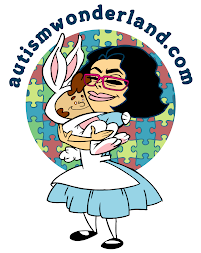 In the world of mainstream bloggers, a Latina blogging specifically about autism is rare. Two years ago when I attended the BlogHer Healthminder (Special Needs) day - I realized I was the only Latina in the room. A room of maybe 80 women - all special needs bloggers. I was the only one. And it bothered me. Because I know there are many Latina moms walking in my shoes. We need our stories heard too. So if you're a Latina Blogger and you blog about autism or raising a child with special needs - let a sistah know in the comments okay. Leave a link to your blog. I'd love to see you representing at a blog conference. And if you're in the NYC area - I hope to hug you at LATISM. But until then...join us for the weekly #latism Twitter Party tonight (Thursday) at 9:00pm EST! We’re talking HEALTH at #latism13!